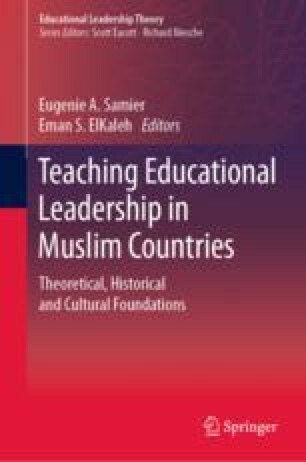 This chapter provides an overview of several topics relevant to constructing an approach to teaching educational administration and leadership in Muslim countries. First, it places the topic in the context of the changing nature and critiques of the field that argue for a greater internationalisation to both resist some of the negative aspects of globalisation and to represent countries’ traditions in the professional curriculum. Then, it identifies literature that presents the underlying principles and values of Islamic education that guide curriculum and pedagogy and shape its administration and leadership including the Qur’an and Sunnah and the classical educational literature which focuses on aims, values and goals of education as well as character development upon which a ‘good’ society is built. This is followed by a section on the Islamic administration and leadership traditions that are relevant to education, including the values of educational organisations and how they should be administered, identifying literature on the distinctive Islamic traditions of leadership and administrator education and training as it applies to education from the establishment of Islam and early classical scholars and senior administrators in the medieval period who laid a strong foundation for a highly sophisticated preparation and practice of administration in philosophical writings and the Mirrors of Princes writings, and subsequent authors who have built upon it up to the contemporary period. The final section provides an overview of the chapters in this collection. Ely, D. P. (1999). New perspectives on the implementation of educational technology innovations. https://files.eric.ed.gov/fulltext/ED427775.pdf (accessed 15 May 2018).